Patrick Langot trained at the French school of cello under Jean-Marie Gamard, Erwan Fauré, Henri Demarquette, and forged his own artistic identity by privileging encounters, while not being afraid to head off the beaten track on more than one occasion. By turns a soloist, chamber player, improviser and teacher, he refuses to be boxed in and has developed a style nurtured by the many experiences that have punctuated his career. His last album dedicated to Ginastera’s music (2016, Klarthe Records) with soprano Maya Villanueva and pianist Romain David is being acclaimed by critics. Patrick plays a cello made by Auguste Sebastien Bernardel, AKA “Bernardel Père” in 1820. A fervent advocate of contemporary music, he has worked with composers such as Régis Campo, Oliver Greif, Nicolas Bacri, Alexandre Gasparov, Benoît Menut, Gabriel Sivak. He collaborated with the composer Louis Dunoyer de Segonzac to record the complete collection of television dramas ‘Contes et nouvelles du 19ème siècle – Au siècle de Maupassant’ produced by Gérard Jour’Hui for France Télévisions. The pieces specially arranged by LDS for the series revisit classics of the chamber music repertoire. Interpreting the music of 17th and 18th century composers on a period instrument is not only about aiming for historical authenticity. The cello, as all orchestral instruments, was subject to constant modifications before its current form and sound were found. In rediscovering the timbre and harmonies of an instrument used at the time of Bach, Gabrielli, Vivaldi or Haydn, the performer is offered an area of freedom, of ‘new’ expression. After studying with David Simpson, Patrick Langot performs on baroque cello the suites and sonatas of J.S. Bach, but also concertos by Haydn, CPE Bach, Porpora, Vivaldi, as well as sonatas and riccercare by Gabrielli, Jacchini, Boismortier and Geminiani amongst others. Patrick Langot plays an anonymous baroque cello with catgut strings dating back to 1704 and a 5 strings “piccolo cello” made by Leila Barbedette in 2011. His passion for baroque opera and vocal music has lead him to collaborate as cello soloist and continuo player with a number of period instrument ensembles such as the Parlement de Musique (M. Gester), the Musiciens du Louvre Grenoble (M. Minkowski), La Réjouissance (S. Intrieri), La Simphonie du Marais (H. Reyne). He was also the cello soloist of the Ensemble Matheus (J.C Spinosi) from 2004 to 2006, as well as of Orfeo 55, lead by the counter-alto Nathalie Stutzmann from 2010. His duet with the harpsichord and pianoforte player Aline Zylberajch offers a unique occasion to listen to the Bach violin or viola da gamba and harpsichord sonatas performed with a five strings piccolo cello, as well as Vivaldi’s cello sonatas or Schubert’s “Arpeggione”. Their program of cantatas and sonatas by Händel, Porpora Vivaldi and Bach, ‘Il Dolce Tempo’, with the counter-tenor Iestyn Davis unites the deep and ethereal voice of the singer and that of the piccolo cello, renewing with the glory days of Italy in the 18th century. These ‘New Talent’ concerts provide an opportunity for young lyrical singers at the start of their career to perform Italian and German sacred music in conditions close to their execution in the baroque era. The piano quintet is a unique ensemble on the French musical scene. Far from the short-lived events that bring together famous quartets and renowned pianists, Syntonia has built its sound over time. Their brand new Charles Koechlin album will be out in 2018 (Timpani Records), and was rewarded 5 Diapasons. Syntonia likes to play in various sizes within a same concert, like with the violinist Sarah Nemtanu, with whom they recorded the ‘Salon de Musique’ #6 for ARTE CONCERT in June 2012. They are especially interested in the music of today: they work closely with Henri Dutilleux, Edith Canat de Chizy, Jacques Boisgallais, Nicolas Bacri, Olivier Greif notably. Their meeting in 2000 with the latter was particularly significant. They first performed his 4th string quartet ‘Ulysses’ a month before his death, and recorded it at Triton two years later. The record was unanimously acclaimed by the critics. A new record devoted to two new pieces by Greif was released in 2010, also to wide critical acclaim (Zig-Zag/Outhere). 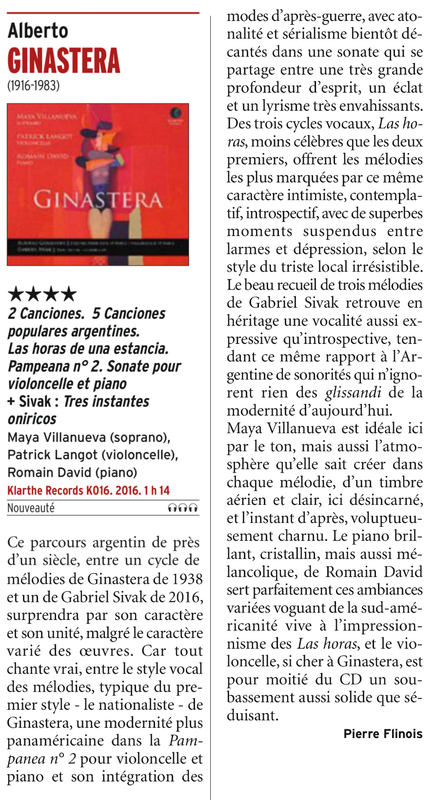 4 stars Classica, 4 keys in Opera Mag, 5 Quavers Pizzicato for “GINASTERA”!